It’s blasting your blood pressure off the charts and leading to an onslaught of other health problems, such as stroke and heart disease. Now, a recent report from the Center for Disease Control and Prevention is saying a whopping 90% of American’s are consuming too much of it. It’s hiding in the foods you eat, some of which you aren’t even aware of. This secret, silent, deadly killer…is salt. The CDC report, released on February 7th says that on average people are consuming 3,300 mgs of sodium on a daily basis – when they should be limiting intake to less than 2,300 mgs. More stringent recommendations are in place for salt intake if someone has a history of high blood pressure, kidney disease or diabetes, as well as anyone who is over the age of 51. For the average adult, the recommended maximum salt intake level is 1,500 mg, or less than one teaspoon per day. The average level for healthy children is 1,000-1,500 mg per day. Exceeding these levels puts you at risk for a serious onslaught of health problems. Salt could be hiding in foods you eat, too, which makes its presence even more concerning. Common culprits of the hidden salt crimes include: processed food, frozen dinners, and canned vegetables. Limiting salt intake is an act that should be taken seriously. 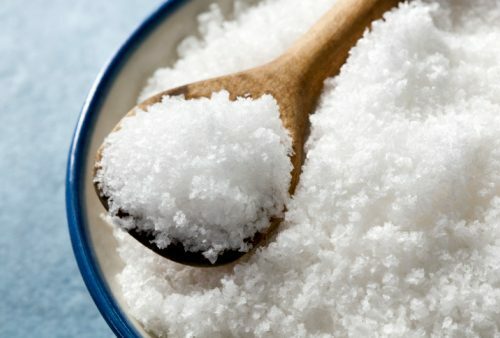 Kosher salt and sea salt are only considered nominally better for you than regular table salt – so keeping a keen eye on your purchases becomes imperative. Buying fresh fruits and vegetables is a good place to start, and looking for products that specifically state “no salt added” on the label is another easy option. Keep in mind that products reading “reduced sodium” only mean 25% less sodium, and are best avoided. The CDC report is clear in the implications of the over consumption of salt. It says “too much sodium increases a person’s risk for high blood pressure. High blood pressure often leads to heart disease and stroke”. And with more than 800,000 people dying each year from heart attack and stroke, it becomes important to be more aware of sodium consumption, and ultimately limiting it.